Residents have access to indoor mail boxes. Lakeview Towers participates in a program where aides are assigned to each senior building if resident qualifies. The Senior Services Coordinator assists Plattsburgh Housing Authority senior residents obtain services. The coordinator interacts with the residents to help improve their quality of life, as well as promote independent living. The Plattsburgh Housing Authority offers a full-time maintenance service. There is an employee assigned to each complex. During office hours, any work item that needs to be done, must be called into the maintenance office. Work orders are computer generated and are given to an assigned maintenance worker. All work orders are addressed in a timely manner allowing for emergency items first. An “emergency” work order phone has been established for emergencies when the office is closed. An assigned employee answers these calls and responds to all emergencies. Emergency items are health and safety issues such as: non-functioning smoke detectors, water leaks and electrical problems. 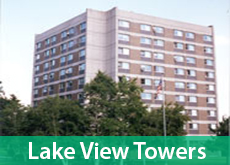 Lakeview Towers is a nutrition site for the Clinton County Nutrition Program. The Senior Sentinel has monthly menu. The Senior Citizens Council of Clinton County will mail a Senior Sentinel to your home. The Grocery Bus runs every week except on holidays with alternating stores every other week. Tuesday’s is Price Chopper and Thursday’s is Hannaford. This bus service is paid for by the grocery stores and brought to you by First Transit, Inc. (518) 563 – 3672. Each high-rise has a community room with cable television, a kitchen area, and various scheduled events. Community rooms may be reserved by the residents for special events.